Connect a QuNeo to the KMI MIDI Expander. The image above shows QuNeo connected to a hardware synth via our MIDI Expander (sold separately). Connect the MIDI Out on the Expander to the MIDI In on a synth or other hardware device. 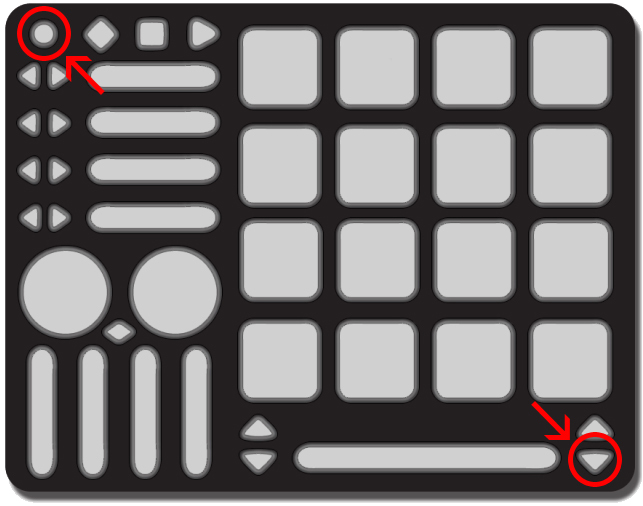 Put QuNeo into MIDI Expander mode by holding down the mode button and the bottom-right down arrow simultaneously (as shown in the image below). The QuNeo LEDs will swipe like they do when you first connect to power, indicating that you have successfully put QuNeo into MIDI Expander mode. Tip: It is necessary to put the QuNeo into MIDI Expander mode every tim eit is connected to a MIDI Expander.